This product is now obsolete and no longer available. The Star 2000 is an extremely efficient way of conducting test sieve analysis. It is fast and accurate and provides detailed information about the particle size distribution of a sample in a clear, concise manner. 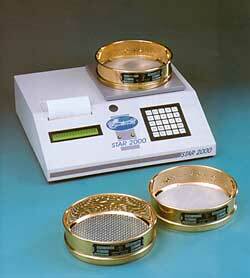 The Star 2000 is a dedicated "Sieve Test Analyser and Recorder". It incorporates a precision balance linked to a microprocessor and printer. The Star accurately weighs and memorises the net weight of sieves and receiver before sieving. It compares these with the gross weight after sieving and makes the necessary calculations to provide a detailed analysis of the particle size and distribution. Because the Star does all the necessary calculations and then stores the data and results it saves a great deal of time particularly in volume work. The test results can be stored for future reference as a master. It will compare current test results with up to five master tests. It will store the individual sieve weights of up to ten sieve stacks. It also operates as a stand alone balance. The Star 2000 is a single portable unit weighing less than 16kg. It incorporates a balance sensitive to ±0.1g. Max. practical sieve diameter: Up to 200mm or 8"
Please fill out the following fields and we will e-mail you a quotation shortly. © Copyright Cadmus Distribution Group Limited trading as: Keison Products, VoIPon Solutions & 4Gon.